“Miami is Nice” was a monthlong public group art exhibition, queer performance series, and gay wedding celebration inspired by the hit 1980’s television show The Golden Girls set in tropical South Florida, offering an escape to a queer paradise: a world in which love wins. A Creative Union redefines wedding traditions. A Creative Union is about expression. “Miami is Nice' is an amalgamation of healthy nostalgia and the romance of new wave art. A beautiful curation of pieces that would swoon the soul of any 80s enthusiast. The fact that the collection of works were brought together to celebrate the union of two souls makes it even more magical. The energy of the space has been ingrained into my memory; this exhibit was truly unforgettable." A Creative Union is about inclusivity. Nick & Zach first e-mailed me in 2016 wanting to share an idea they had for an art exhibition/wedding they were planning and suggested may be the perfect person to curate with, "not to mention, their new best friend ; ) ". After just having come up with the idea to integrate contemporary art into weddings, Zach & Nick quickly became Creative Union's pioneer clients for the 1st ever Creative Union! As the months went by, I consulted on the creative direction, language, and concept of their art exhibition to tell their story in a more intentional way beyond a Golden Girls/Miami themed wedding. Along came co-curator, Carlyn Thomas from Terrault Gallery to help us source artists from all over the country through dozens of individual artist invitations and a call for art that attracted over 80 artist submissions. With a team of four neon art lovers, we spent two years developing our biggest project yet, "Miami is Nice". After countless e-mails, phone calls, and meetings, we then nailed it down to an 80's, joyful, neon, tropical, pastel, Art Deco, Golden Girls, inspired art exhibition featuring 45 artists. I then oversaw the design of the show, co-wrote the educational texts, and with the help of friends, family, and volunteers, we installed one of the most exciting art shows Baltimore has ever seen! Our mission was completed as we created a 1980's Miami escape from the struggles of being queer under today's political climate. 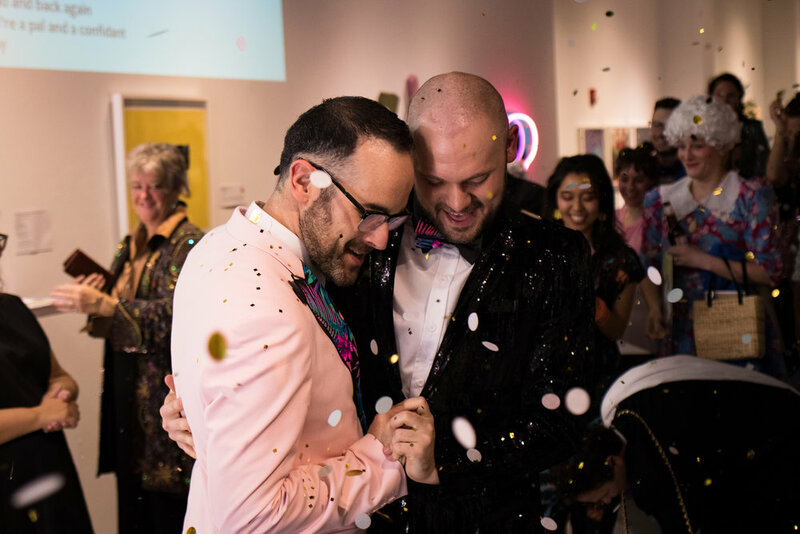 This art exhibition and series of programs was open to the public and served as the ultimate setting for a gay wedding celebration in order to inspire a world where love wins. Three public events became a natural part of the exhibition as imagined by Nick & Zach, so that the greater Baltimore community could enjoy the month long exhibition with the help of Creative Unions Event management and Consulting services.